A quick video to show you what this gun shot like prior to a couple of improvements! It was a little inconsistent, though bear in mind that this is without the hop set at all. There are several improvements that have been made since then to improve consistency and power. 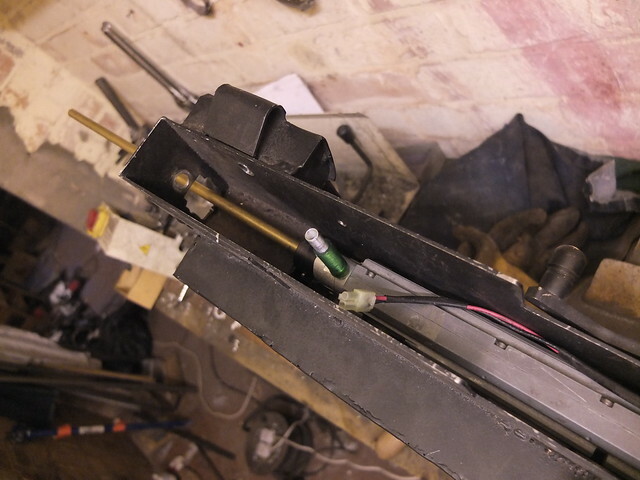 Firstly, a large, stiff spring holds both the outer barrel and the hop unit in place against the gearbox. At this point, it became apparent that having quick-replacement magazines is a bit pointless as any magazine for this gun will be a high-capacity one. As a result I dropped this idea and went for the far more secure (and better feeding) fixed version. This can still be swapped between an electronic hi-cap (stored in an MG42 ammunition box, as used in WW2 with the MG08/15) and a smaller hi-cap that can be stored in the drum itself. 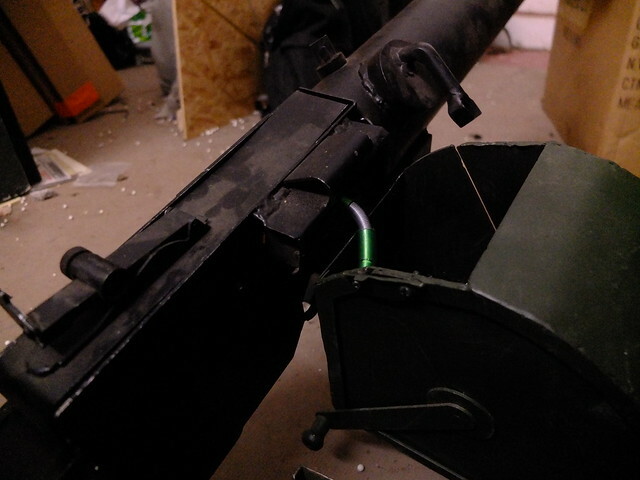 A drum magazine lock was added to stop the drum from opening unexpectedly. 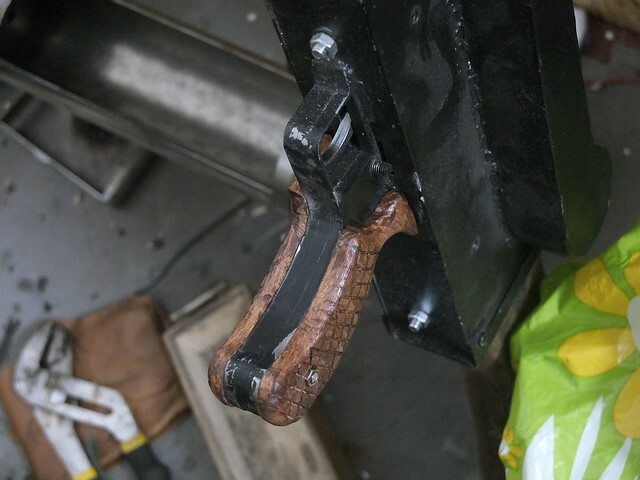 The crank handle on the original was used to wind in the cloth bullet belt. It is fixed on this and the sides of the spindle hold the magazine in place. The details on the water tank, filling cap and steam hose connector. 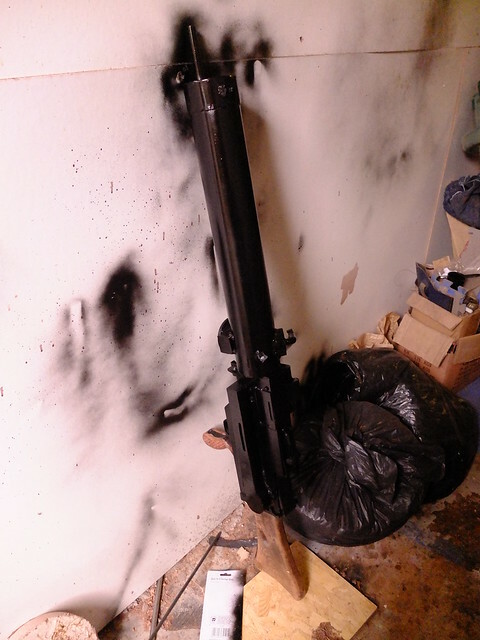 The small magazine attachment for the drum magazine. This attaches to the top of an M14 magazine. A top-up of paint to get it pretty before testing! The elevation adjustment and rear sight. Last week the laser cuttings arrived so after a delightful holiday in the New Forest and attending the Battle of Aachen (at Combat South) I decided to start marking the pieces up for welding. Having designed the parts some time ago it’s quite a challenge trying to remember what goes where sometimes! As a result I thought it would be good to match up and have opportunity to check everything before welding it permanently. Above: Receiver unit: left panel and associated parts. Below: Back panel and buttstock holder. More to come when some welding has been done! As part of the MG08/15 build, my customer asked for a box magazine for use in fixed positions, as I am waiting to pick up the components of the gun itself from the laser cutters I though I may as well get started on this! I started by getting an MG42 ammunition box from Ebay, although the MG08/15 used wooden ammunition crates in the Great War, in the context this gun is going to be used (WWII airsoft) this is perfectly correct. Many of these guns used in the second world war were adapted to take the chain belts of the MG34/42 instead of the cloth belts they were originally used with, so my next search was for some ammunition belt length and some inert rounds! Having found some belt and enough rounds for the snail drum magazine, I set to work building the magazine. I am using the internals of an M249 magazine to automatically feed the BBs into the feed tube. I am mounting this unit into a plywood box that will be able to be pushed down to switch the motor on and off. BBs can be poured in the top of the hop to top up once ammunition has run down. The beauty of this unit is that there is still plenty of space in the ammunition can for spare BBs, tools or any miscellaneous bits that the user would find handy. This is of course not finished yet, more pictures to follow as progress is made! As ever, if this has given you an idea for you own project do let us know! You can email us at: enquiries.vintageairsoft@gmail.com.